Valerian is spicy, bitter and warming and is used most often for insomnia, stress and anxiety, menstrual cramps and pain relief. It can also relieve gas, spasms, pains and general symptoms of stress. Make into a tea or tincture. For a small number of people, valerian can have the opposite effect, so if you’re planning to use valerian as a night-time sleep support, consider trying it during the day first to find out if you’re one of those people. 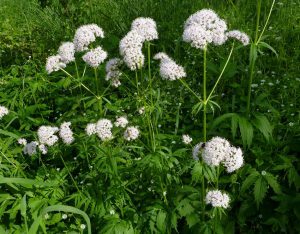 Fresh root tincture of valerian is best as it preserves the volatile oils and, according to Matthew Becker, is more “tonic and less reactive” than preparations from the dried root. Matthew Wood recommends a dosage of 1-60 drops. A hearty, relaxing tea for strengthening the nervous system. Valerian Tea Blend is one of the better-tasting valerian formulas. Decoct the licorice root for 15 minutes. Turn off the heat and add the lemon balm and valerian root. Infuse for 45 minutes. Strain; drink as much and as often as needed. Try this Valerian Mint Cordial as a before bed remedy. And for some fermented fun try out this Valerian flower Mead recipe from Brittany Nickerson at Thyme Herbal. Cautions/Contraindications: Valerian is considered safe however reactions are idiosyncratic. Valerian may cause symptoms it is meant to cure in some.